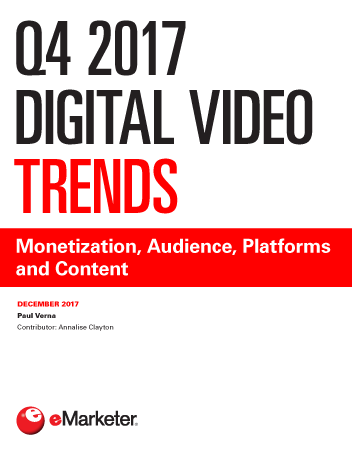 This is the latest installment in an ongoing series of quarterly video ecosystem overviews focusing on monetization, audience, platforms and content. The goal of each report is to provide a summary of key recent developments. US programmatic digital video ad spending is on track to surpass $13 billion in 2019, accounting for more than three-quarters of total digital video ad spending. It wasn’t long ago that programmatic buying was the exception rather than the rule in video advertising, but that changed around 2016. The vast majority of video ad volume is now transacted through automated channels. The latest eMarketer forecast shows a slight acceleration in the growth rate of time spent viewing digital video, while traditional TV continues to decline. TV still accounts for a much larger share of time, but the trend lines are moving inexorably toward digital. Viewing patterns are shifting toward both ends of the device spectrum: smartphones and connected TVs. Desktops and laptops have largely been superseded by smaller and larger devices. Original content is a leading reason why people sign up for subscription-based video services such as Netflix, Amazon and Hulu. Still, only about 20% of viewing time on those platforms is spent watching original programming, with the rest dedicated to licensed shows and movies. "US programmatic digital video ad spending will reach $13.43 billion in 2019, or 76.5% of total digital video ad spending. As recently as 2015, only 39.0% of video ad dollars flowed through programmatic channels."